Consequence and risk analysis experts evaluating explosion hazards have historically had to undertake time-consuming analyses and have been unable to show all the combined influences in different scenarios. DNV GL’s new Phast 3D Explosions software module enables advanced 3D modeling, increasing both the accuracy and detail of the evaluations as well as information about the speed of vapor cloud explosion (VCE) analyses. Phast software is used extensively by governments, industries and academic institutions to help understand the hazards posed by process activities. It is used to model safety aspects of design options for proposed new facilities and for operational changes in existing facilities. The software examines the progress of a potential incident from the initial release of hazardous substances to far-field dispersion including flammable and toxic effects. The analyses take numerous parameters into consideration including variables such as wind direction and speed. 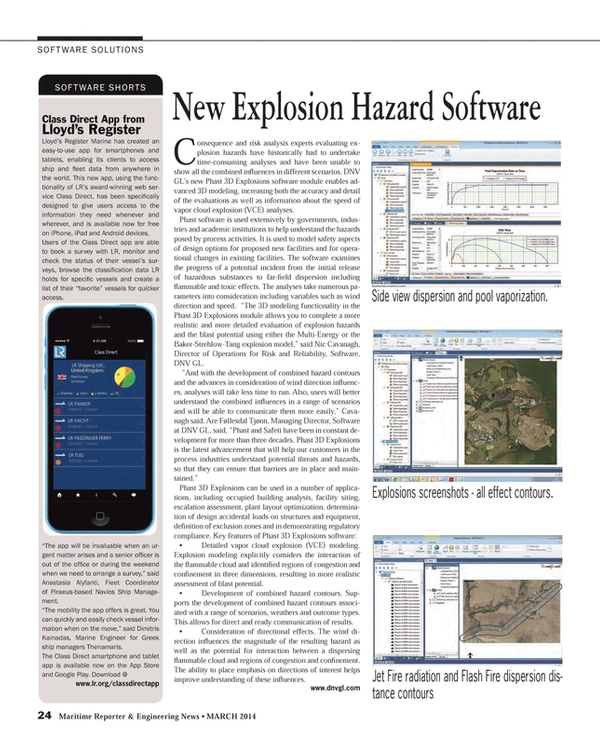 “The 3D modeling functionality in the Phast 3D Explosions module allows you to complete a more realistic and more detailed evaluation of explosion hazards and the blast potential using either the Multi-Energy or the Baker-Strehlow-Tang explosion model,” said Nic Cavanagh, Director of Operations for Risk and Reliability, Software, DNV GL. • Detailed vapor cloud explosion (VCE) modeling. Explosion modeling explicitly considers the interaction of the flammable cloud and identified regions of congestion and confinement in three dimensions, resulting in more realistic assessment of blast potential. • Development of combined hazard contours. Supports the development of combined hazard contours associated with a range of scenarios, weathers and outcome types. This allows for direct and ready communication of results. • Consideration of directional effects. The wind direction influences the magnitude of the resulting hazard as well as the potential for interaction between a dispersing flammable cloud and regions of congestion and confinement. The ability to place emphasis on directions of interest helps improve understanding of these influences.